From the time it all began, Ray Hunt has tried to show the human how to approach the horse. Many have tried to emulate, which is the highest form of flattery, but none have had the feel, timing and balance which Ray works on still to this day. Ray is always working from where the horse is at, being aware of the horses physical and mental expression. There is nothing mystical, just a man with a passion for horses ever thinking, ever feeling, always working on how much less he can do to get the understanding come through. A real treat! 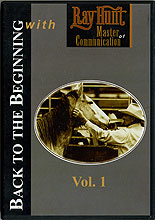 This DVD is a 60 minute demonstration of Ray's colt starting magic from the early 80s. You will not be disappointed in this valuable footage of the master. Ray Hunt has started more than 10,000 colts. For the last 30 years he has been giving educational clinics throughout the U.S., Canada, Australia, and Europe. Here Ray shares techniques and philosophy that apply to all riding disciplines. And here, in just a few days, colts get the best possible start to a lifelong relationship with riders. As Ray often mentions to folks - â€˜Iâ€™m here for the horseâ€”to help him get a better dealâ€™. Spend three days with Americaâ€™s most effective horseman as he starts four previously unridden colts. The Ray Hunt Colt Starting Clinic youâ€™ve always wanted to attend â€” Ray himself working with the colts from the ground!